Storing energy is one of the major challenges of our time. Posessing adequate storage capacities will not only facilitate the role of renewable energy sources in the grid, but it may also enable us to modify our approach to mobility, road traffic in particular. On his blog, Fuel Cell Nation, Keith D. Patch published a short article about carbazole which might be a potential future candidate for energy storage. The article is re-posted here with kind permission from the author. Modern societies need a considerable amount of energy, which is almost entirely used the three sectors industry (including services), mobility and household, at roughly equal parts. Thus, the energy consumed at home forms a substantial part of the entire final energy use. In this posting we study the situation in Switzerland which is one of the most competitive and industrialized countries of Europe, though not being a member of the EU. All raw data for the subsequent investigation stem from Swiss Statistics which provides excellent information on all areas of consumption. In particular, we will focus on the period 2000-2010. The above-mentioned sectors had the following shares in the total final energy consumption in 2010: industry and services 35 %, mobility 34 % and household 30 %. Total household energy use went up by 14.1% during the first decade of this century. However, this obvious increase does not take into account that the number of people living in Switzerland has also risen during that period. Thus, the relevant figure to look at is the consumption per capita, and here the situation looks quite different as can be seen in Fig. 1. 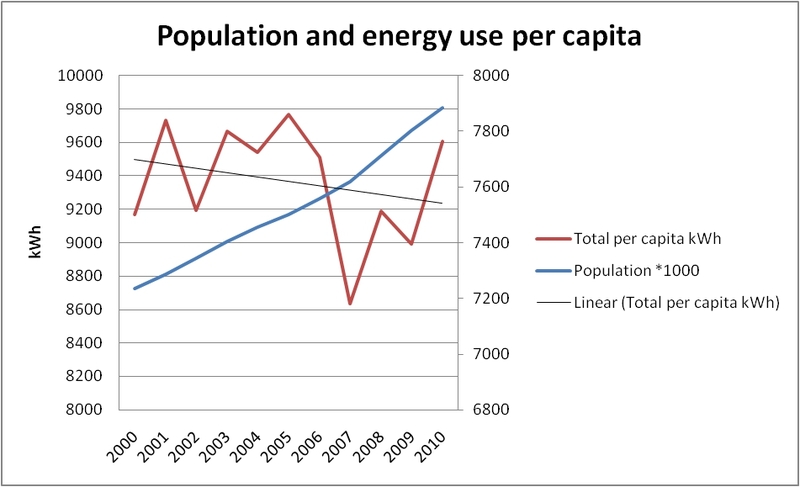 The trend line makes clear that the specific energy use per person has gone down over the years. 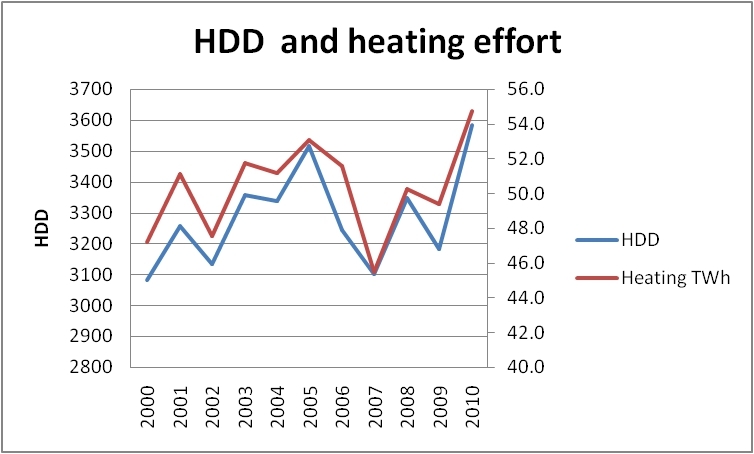 The steep increase since 2007 is well in line with the number of heating degree days (HDD) following a similar pattern as can be seen in Fig. 2. Apparently, it has become colder between 2007 and 2010. Fig. 2 Heating degree days (HDD) and heating effort in Swiss households. The similarity between the red curves in Figs. 1 and 2 is not accidental, as more than 72 % of total household energy are used for heating purposes (in 2010). Thus, changes in the number of heating degree days should be reflected in the heating effort. Warm water makes up for another 12 % of household use while the remaining 16 % are shared among various sectors such as lighting, cooking, washing, drying, etc. 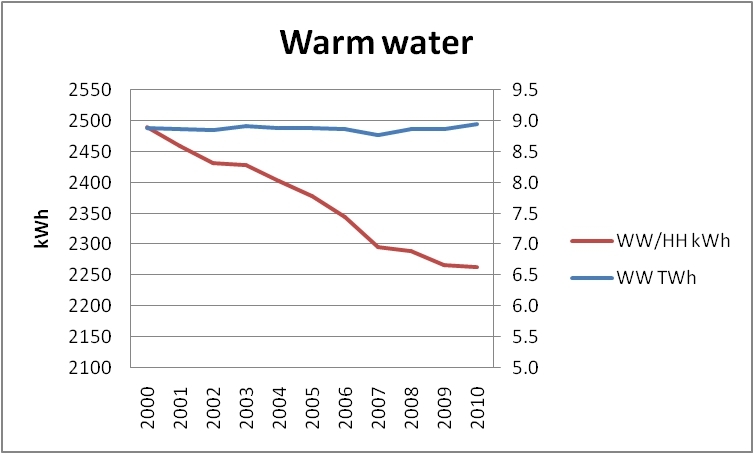 A closer look at the figures for warm water reveals that consumption has remained relatively stable (Fig. 3). Taking into account the growing number of households (+ 11 %) during the period in question naturally leads to the conclusion that each household uses less and less warm water. Fig. 3 Total energy used for warm water and consumption per household (/HH). Fig. 4 shows the contribution of other sources of household energy use. Their aggregated consumption volume is relatively moderate as stated above. Nevertheless, as a whole they are not to be neglected although their individual shares are not as important as the ones for heating and warm water. Fig. 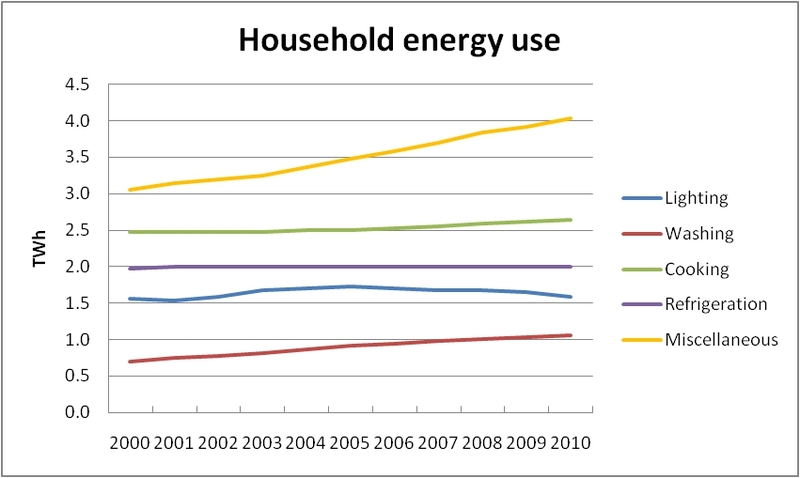 4 Household energy use (except heating and warm water). Whereas lighting, cooking and refrigerating (including freezing) have remained virtually unchanged over the years, washing (including drying) and miscellaneous have increased dramatically by 52 % and 32 %, respectively. This is well in line with a growing population as more people require more clothing to be washed. So there are some areas of energy consumption being more sensitive to the number of persons involved while others like lighting tend to be rather independent of population figures. Thus, as stated in my previous posting, growing energy consumption figures (in absolute terms) should not be obscured by ignoring the simultaneous changes in the number of consumers. On an individual basis, we gradually tend to use less energy. This is the good news. But, of course, the crucial question is how much further we can get in becoming more energy efficient. Or, to put it differently, is there a limit and, if yes, where is it? Becoming more energy efficient is perhaps the most straightforward and least expensive way of tackling the energy problem. Recently, the EU has addressed this issue within the framework of the so-called Europe 2020 targets which aim at reducing gross energy consumption by 20 %, producing at least 20 % of all energy from renewable sources and reducing greenhouse gas emissions by 20 % (with respect to 1990 levels). All that is supposed to be attained by 2020 at the latest. Leaving aside the two latter issues, we will focus in this posting on the question of energy efficiency. Lowering energy consumption by 20% (when compared to projected levels) means in particular that by 2020 Europe will use some 1474 Mtoe (mega-tonnes of oil equivalent) of primary energy. Fig. 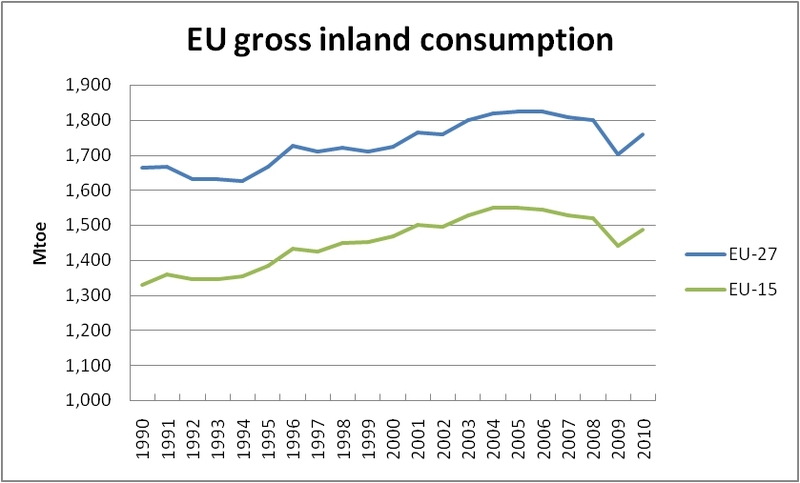 1 shows the development of EU gross inland consumption from 1990 onwards with EU-27 representing the entire union whereas EU-15 refers to the “old” Member States, i.e. excluding those countries which joined the union in 2004 or later. One striking observation is that during the past two decades consumption figures have always been substantially higher than the 2020 target line. Thus we are facing a real challenge. Fig.1 EU gross inland consumption of energy. Source: Eurostat. But looking at absolute consumption levels only does not reveal the whole story since, at the same time, we are also expecting economic growth. And a growing economy means higher energy consumption, at least to some extent. Putting consumption and economic performance together yields another interesting observable, namely the so-called energy intensity which is shown in Fig. 2. This parameter indicates how much energy is needed in order to produce one unit of economic output. Energy intensity is thus measured in kgoe/kEUR (kg of oil equivalent per 1000 EUR). Apparently, this indicator has fallen drastically since 1991. In 2010 it was at 168 kgoe/kEUR for EU-27. Fig. 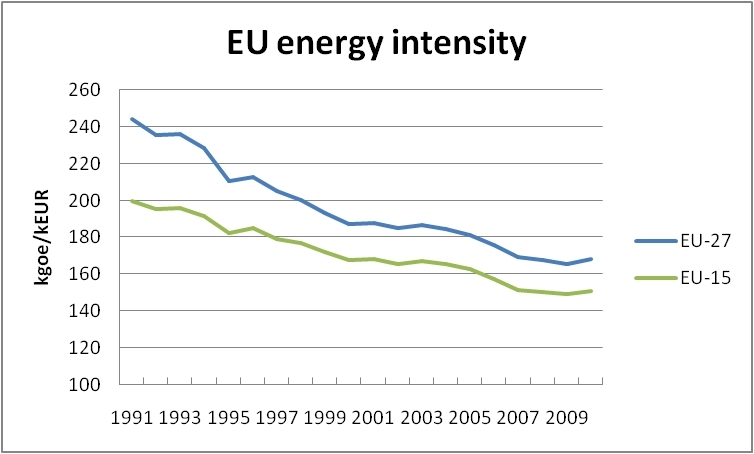 2 EU energy intensity. Source: Eurostat. One apparent feature of this figure is that the gap in the intensity levels between EU-27 and EU-15 is getting smaller over the years, thus indicating that the countries which joined the EU in 2004 or later are outperforming the older Member States (EU-15) when it comes to becoming more energy efficient. Nevertheless, the energy intensity of the younger EU members is still considerably above average. Reducing absolute energy consumption means that intensity figures will drop accordingly. But by how much? In order to obtain an answer to this question, we analysed two scenarios, one with a stagnant economy, i.e. no (real) GDP growth up till 2020, and another one with an average GDP increase of 2 % annually. Taking the zero-increase economy as a reference we find that energy intensity must drop from its 2010 level to some 141 kgoe/kEUR in 2020. This is not too far from the current EU-15 level (151 kgoe/kEUR). However, at EU-27 level this means that the intensity has to go down by some -1.75 % on average per year. Going over to a more dynamic scenario with an average economic growth rate of 2 % we find the respective energy intensity in 2020 at 115.5 kgoe/kEUR. Obviously, the effort is much stronger in this case, requiring an annual decrease of almost -3.7 %. To put things into perspective we may mention that the average intensity gain during the period 1991-2010 was 1.94 % per year. Thus, the prospect of performing equally well in a no-growth economy does indeed look quite promising. However, once the economy is supposed to grow even at a moderate pace, our effort may easily double. In that case, more drastic measures are required in order to attain the ambitious goal. Is the German Solar Dream Coming to An End? Germany used to be one of the cornerstones of the European solar industry. But times have changed and what has so far been considered as the avant-garde of renewable energies is facing a grim reality. A number of German solar panel producers have run into serious economic troubles. The most recent case is the company Q-Cells which filed for bankruptcy earlier this week. For some time Q-Cells used to be the biggest German producer of solar modules. Another company, Phoenix Solar, is struggling with massive financial problems. The same is true for Conergy which, in addition, suffered from serious management errors. Solon, Solar Millenium and Solarhybrid filed for bankruptcy during the past four months. Even the brightest star on the German sky, Solarworld, is no longer as shiny as it used to be due to a changing economic environment. Pampered by abundant subsidies Germany´s solar industry saw a massive growth during the past 10 years. However, recently two crucial factors came into play which led to a substantial shift. On the one hand, there was a discussion in Germany as to how much money should be pumped into renewable energies. Economic analyses revealed that more than EUR 100 billion have been directed towards renewables so far. With ever growing installed capacities this amount is bound to grow over the coming years, thus putting a substantial burden on electricity consumers who, in the end, are paying the bill. As a consequence and in order to keep subsidies under control feed-in tariffs have been cut drastically recently. On the other hand, German producers of solar modules are increasingly suffering from competitors, especially in China. This led to a slump in prices for PV modules (more than 70 % since 2009) which, in turn, increased the pressure on German companies. Being under pressure from two sides, PV producers are now facing a different reality than at the time when solar industry took off. The figure below shows the development of electricity produced from PV. PV power production and share in the electricity grid. Source: AG Energiebilanzen. Although these the growth rates were impressive, starting from virtually zero in the year 2000, the contribution of PV to the power grid remained rather modest (3 % in 2011). Given the low share of PV in electricity production, the question arises what level of subsidies is considered to be justified. One may even wonder if feed-in tariffs are to be abolished at all. What is going to happen? Once the market forces have done their work, PV will continue its upward trend, though at a more moderate pace. But most importantly, the vast majority of PV modules will come from China, thus leaving not much room for production in Europe. What is bad news for the solar industry is, in turn, good news for the consumers and for investors who will see lower investment expenses as the prices for modules have fallen dramatically. PV as such is not to be blamed for the current problems. On the contrary, PV fills a useful niche in the power grid, but not more than that. However, what is to be blamed is a legal framework which created the illusion of a quasi risk-free economy where feed-in tariffs were guaranteed for 20 years and even paid for non-produced electricity in case of network problems caused by the renewables themselves. The price for this illusion was first to be paid by the consumers and now by the people losing their jobs in the companies going bankrupt. 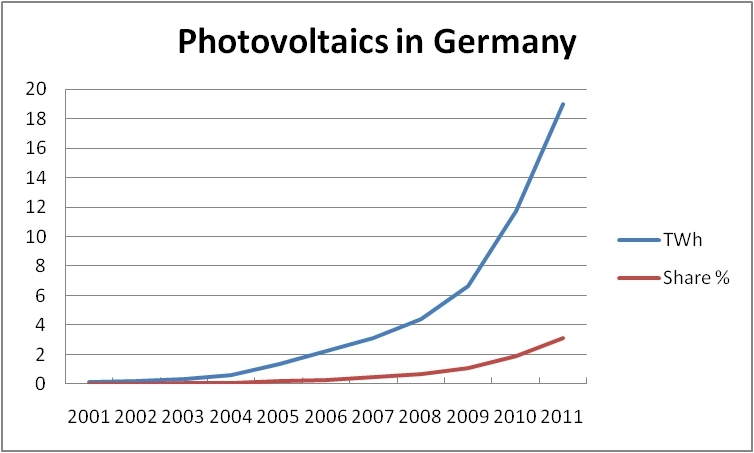 Photovoltaics has certainly a future in Germany as in other parts of Europe. However, its growth needs to be based on a sound economic environment. This process is now under way. It goes without saying that PV will always be a minor player in the field. Nevertheless, it has a role to play and maybe, on a smaller scale and by using smart storage technologies, it may develop into a key power source for local communities.